The continuing development of search engines and their algorithms is affecting the way everyone does SEO. The use of AI and machine learning mean that engines like Google can understand a user’s intent when carrying out a search and provide far more accurate results. We’re also seeing a change in how people search the internet, with many users now choosing to search by voice rather than by text. In this post, we’ll look at how things are changing and what the SEO trends in 2019 are likely to be. Google’s RankBrain algorithm is so sophisticated that it can discover the relevance of a website’s content far better than ever before. It understands the context of a user’s query and searches for content that covers the topic the user wants to know about. To do this, it relies on much more than simple keywords – it also looks for other related concepts in the text. The more of these terms it finds and they more they tie in with the query, the better the page’s chance of ranking. As an example, if someone was wanting to find information about how to cook Italian food at home, the algorithm would look beyond keywords such as ‘Italian home cooking’, etc. and seek the terms it would expect to find in a relevant text: tomatoes, olive oil, linguini, pizza oven, cook for 20 minutes, etc. The more of these concept-related terms the content included, the better it’s chance of ranking. The good news is that it means there is no longer any need to risk a penalty by stuffing keywords into your text – that method of SEO simply isn’t relevant any more. One SEO trend for 2019 that’s become increasingly common for search engines to try to keep users on their own pages. Where once they would have simply produced a list of websites where you could visit to find relevant information, today, there’s an increased chance of seeing your query directly answered on the results page. This comes in various guises. If users look for a product, Google will display relevant ones at the top of the page before they list online stores which sell them. If you ask a question, the answer is usually displayed as a knowledge graph, often lifted directly from a website and saving the user the need to click on the link. Underneath that will be websites with features snippets and the answer to the query will be highlighted in the snippet. Only if a user wants more information are they likely to click on the link. In 2019, those seeking higher rankings should aim to have their content featured in knowledge graphs and snippets. To do this means understanding the questions users ask and creating content that answers them. Indeed, from an SEO perspective, it may require you to create content that contains both the question and the answer, either as a heading and paragraph, a structured table or an FAQ section of a page. The better you can inform a search engine about the precise content of your website, the better it can understand how relevant your pages are to a search query. For several years now, Google has pushed webmasters to use rich snippets as a way of doing this. A rich snippet is the structured data markup that can be added to a site’s HTML to inform the search engines about its content. Ranking highly in search results is, however, only half the battle. In order to generate traffic, you have to get users to click on your link. Markup which helps meta descriptions and star ratings get displayed in the search results have been shown to have a significant impact on click-through rates. Voice search has become exceptionally popular, especially with the use of mobile phone smart assistants and devices like Alexa and Google Home. As people use natural language when conducting voice searches (i.e., we’d type ‘Builder Preston’ but say ‘Find me a good builder in Preston’), website owners can benefit from using longtail keywords that emulate the way we speak. Image search has become more important too. Since Google improved its image search in 2017, users can find images without having to visit a website and browse for them. To take advantage of this, so that users can see your images appearing at the top of the image search results, you should optimise them. This includes giving images relevant file names, alt tags and descriptions, as well as using high-quality images. Over 60% of surfing time and 50% of searches are now conducted on mobile devices. With this in mind, search engines are penalising those websites which are not mobile-friendly with lower rankings. Indeed, last year, Google introduced Mobile First Indexing – which means they now use your mobile website, not your desktop version, as the one on which to rank your site. While having a responsive website is essential in order to be mobile-friendly, it is not the only criteria search engines are looking for. One of the issues with mobile devices is that they can’t always be connected via high-speed wi-fi and this often results in websites loading slowly. For search engines, the onus to provide an effective solution lies with the website. They want webmasters to do everything they possibly can to ensure pages load quickly, even on older phones using 3G networks. While using caching, script minification, image optimisation and content delivery networks are all able to help, when it comes to mobile page speed, the emphasis now is on using accelerated mobile pages (AMP). These very basic versions of your pages, often containing nothing but text, can be served to devices when they have a poor connection, ensuring they load quickly. The work we need to do to optimise our websites is constantly changing. What worked well in 2018 won’t necessarily keep us on the top page in 2019. Standing still, therefore, is a risk. 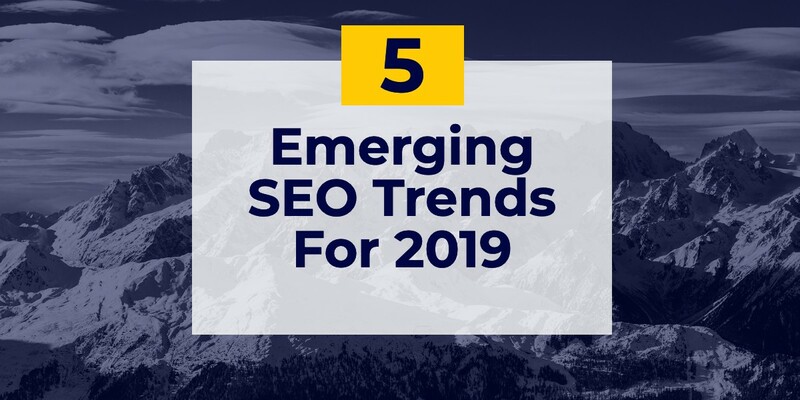 Hopefully, the five SEO trends for 2019 shown in this post will help you understand the changes which are likely to take effect over the coming year and help you get your SEO strategy in place. If you are looking for expert assistance with your site optimisation, check out our SEO page.